Updated Up to 500 people* are believed to be injured after a meteorite blazed through the sky and smashed into central Russia this morning. The space rock, estimated by the Russian Academy of Sciences to weigh 10 tonnes, hit the atmosphere at a speed of at least 54,000km/h and is believed to have shattered around 30 to 50 km above ground into a shower of fireballs that rained down on Chelyabinsk in the Urals. The shockwave of the meteorite hitting the atmosphere, heard as a sonic boom on the videos, also contributed to damaging buildings and blowing out windows, causing most of the injuries. Deputy Prime Minister Dmitry Rogozin told national news service Interfax that there needed to be international initiatives on how to deal with extraterrestrial objects heading for Earth. He said that neither Russia nor the US currently have the capacity to safely bring down meteorites. Residents of Chelyabinsk heard what sounded like an explosion, saw a bright light in the daytime sky and then felt a shockwave, according to television network Russia Today, Reuters and others on the scene. City authorities have said that hundreds of people were seeking medical assistance, but mostly for light injuries caused by flying glass. No fatalities have been reported as of yet. Chelyabinsk Zinc Plant was damaged by the shockwave, or possibly debris, with one wall partially collapsed, and mobile communication and internet has also been disrupted in the city. Further images of the damage in the city can be found at chelyabinsk.ru here. The Emergencies Ministry has said that over 20,000 workers are on site, surveying damage and conducting repairs. Workers and residents will be scrambling to cover smashed windows, as the temperature in the city is currently -6°C. Australian astronomer Brad Tucker has also pointed out that a brief magnitude 6.8 earthquake in the remote settlement of Syagannakh in Russia's Yakutia Republic was close to the right time to have been associated with the meteorite. 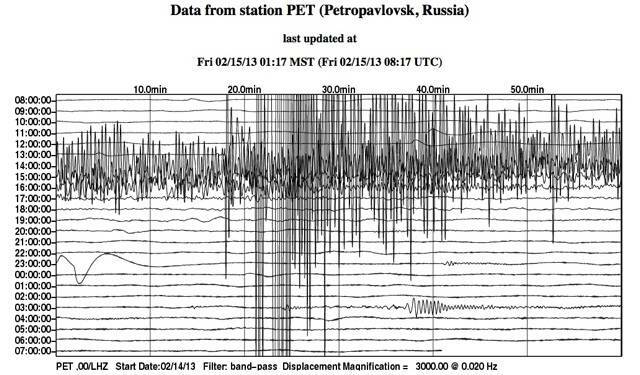 A seismic plot shows a "short, sharp shock" that might have been some of the space rock exploding in the air, although Tucker acknowledges it could also be a coincidence. The meteorite has struck on the eve of asteroid 2012 DA14's closest approach to Earth, prompting speculation that the Chelyabinsk meteorite is a missile from the asteroid. But according to radio astronomy expert Derek McKay-Bukowski, the events can't be linked. The asteroid is travelling at approximately 8 km/s and, if the Chelyabinsk object was related, it would have required a deep space velocity of about the same. Even if the two were related, this would put the two objects some half a million km apart. In any case, the two events are not related. The Guardian has released new figures on the casualties caused by the Friday-morning meteor explosion over Chelyabinsk: as of Friday afternoon, Pacific time, those figures stand at 1,100 who have sought medical care and 48 who have been hospitalized.